I first had Venezuelan arepas at an awesome restaurant in Brooklyn, NY called Caracas Arepa Bar. They specialize in stuffed arepas, as the name implies. For those who don’t know, arepas are griddled corn cakes that are a food staple in places in like Colombia and Venezuela. They’re served with almost every meal. The thing I love about Venezuelan arepas is that they’re typically filled with all types of delicious fillings, just like a sandwich. The Reina Pepiada arepa was named after Susana Dujim, a Venezuelan beauty queen who was crowned Miss World in 1955. She visited a local restaurant, and they created a new stuffed arepa, featuring chicken and avocado. The owner named it La Reina Pepiada, which translates into “La Curvy Queen” in tribute to the curvaceous beauty queen. 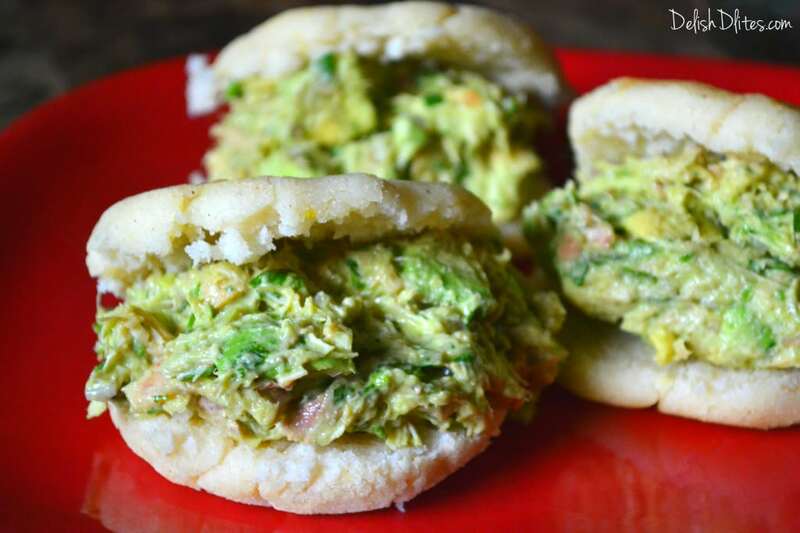 This reina pepiada arepa features a delicious avocado chicken salad, it is a super healthy, satisfying and fast weeknight dinner option. You can have these on the table in 30 minutes or less. Plus, arepas are gluten free, so they’re a great bread substitute! Mix the salt, masarepa and hot water together, until the mixture comes together. You should be able to form balls of dough in your hands like silly putty. Divide the arepa dough into 4 portions and form them into discs, about 1/2 inch thick. Don't make them too thin, you want to be able to split them open later. Heat a griddle or cast iron skillet to medium, drizzle with canola oil and cook the arepas for 10-15 minutes, until they're crunchy and charred in spots on both sides. Mash the avocados with a pinch of salt and 1 tablespoon of lime juice. Add in 2 tablespoons of lowfat mayo, and mix. Toss the chicken, onions and cilantro into the avocado dressing. Stir thoroughly to combine, and season with salt and pepper to taste. To slice the arepa open, lay your non-cutting hand on top of the arepa. Using a small knife, slide the knife around the edge of the arepa, until you've cut all the way around. Pull the 2 halves apart. Place a scoop of the chicken salad onto one half of the split arepa. Garnish with cilantro, and dig in. Looks yummy. 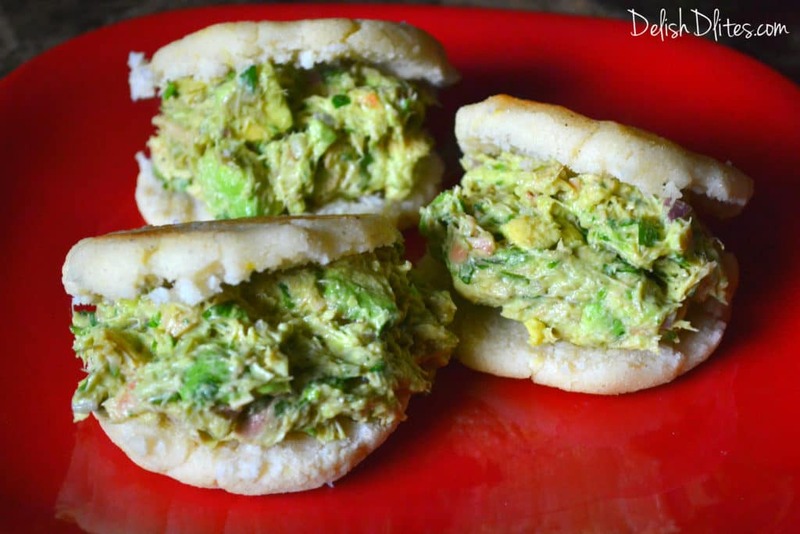 How many Reina Pepiada Arepas I can make with this recipe..? 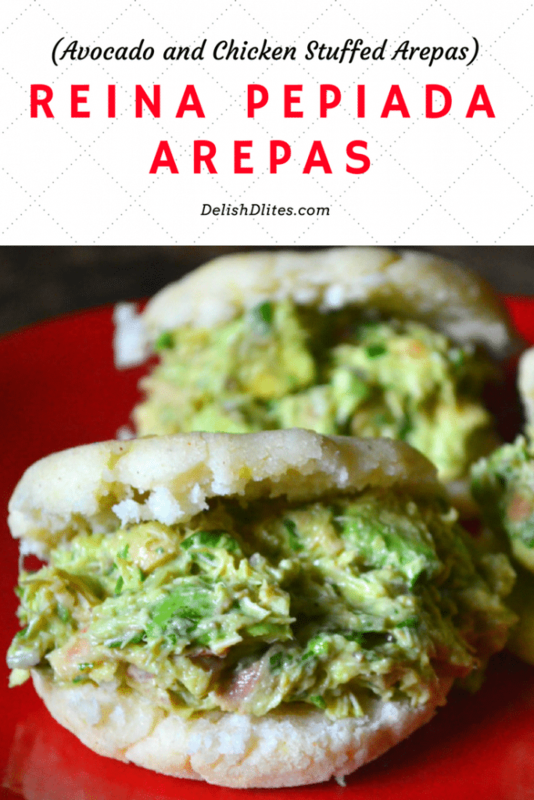 You should be able to make about 4-6 arepas with this recipe. This looks to amazing I am so trying this sometime soon! !